Before spring break writer's cramp sets in, we thought we would offer up our candidate endorsements as the election fast approaches on Tuesday, April 7. This election, more so than in years past, is crucial and a potential game changer for the district. In order for that to happen, parents must be well informed before going to the polls or submitting ballots through early voting. Make no mistake: every vote will count and will make a difference regarding the future direction of the district. But before we launch into our endorsements, we would like to be very clear in our approach. Yes, we have opinions about the candidates and who should be elected. But our endorsements are also centered on fact. Let's compare this approach with the vapid, ill-informed editors of a local paper. Their recent endorsements of McCurry and Turek, we believe were mostly based on opinions, not on facts. Yes, that lack of journalistic integrity was front and center for all to see in their last edition. Remember, the editors do not have children in D181 schools, nor are they qualified to make claims that, for example, the Learning for All plan should continue, which seemed to form the basis for their endorsement of McCurry and Turek. This is irresponsible and unacceptable. So, we are approaching our endorsements with solid facts, track records, and experience because our kids have experienced the unfettered, unproven changes during the past several years that have caused great turmoil and frustration. We have a stake in this, and we want the best for all district children. At this point, we do not believe the D181 administration has the leadership and competence to move the district to a better place. It will take an engaged BOE to demand accountability, something that hasn't happened in several years. We will be voting for the following candidates (listed in alphabetical order) and we hope you do too:  Jennifer Burns, John Czerwiec, Richard Giltner and Leslie Gray. 1. They are parents of current D181 students. 2. They do not have any conflicts of interest that could influence their votes on board decisions they will be asked to make in the next four years. 3. They have provided thoughtful, substantive answers to the many questions they have been asked by the press and during the debates that show that they have a working knowledge and understanding of the current D181 curriculum issues, facilities issues, financial and tax levy related issues. They are knowledgeable about pending legislation that could shift pension funding state funding to our district and the impact such a change might have on lowering available revenue. 4. The answers they have given have been raw, honest and thorough. They have not been afraid to identify areas of concern, explain why they are concerned and then address how they would like to see the BOE tackle the issues. They have not used buzz words to deflect away from critical issues that need both the administration's and the BOE's immediate attention. The thorough answers they have given, during the debates and in their newspaper interviews, actually sound like them; rather than carefully crafted answers that may or may not have been prepared  by their supporters. 5. They have identified decisions and issues that the BOE has addressed that lacked supporting data, and have represented that they intend to make data-driven decisions; not simply rubber stamp administrative recommendations, especially in the area of curriculum. For nearly two years now we have been blogging about the lack of data, lack of accountability and negative impact the Learning for All Plan has had on our district's students. It will be a refreshing change to have board members who will want to make data-driven decisions and will not simply accept whatever recommendations the administration makes. 6. Similarly, they have made it clear that it is not their job to micromanage the district, but that what has been lacking is accountability for decisions that are made. 7. The answers they have given to financial questions have established that they will be fiscally conservative, not tax and spend board members. 8. Three of them -- Burns, Czerwiec and Gray -- have been visible and regularly attended D181 BOE meetings for several years. They did not just start attending the meetings after deciding to run for the school board. They have spoken respectfully during public comment as concerned parents and taxpayers on a variety of issues (which will be further elaborated below). While Giltner has not attended meetings for as long as Burns, Czerwiec and Gray have, he began regularly attending the BOE meetings well before deciding to run for the board and before going through the Caucus process. He has continued to attend the BOE meetings since receiving the Caucus endorsement. The answers he gave during the Clarendon Hills debate, in particular, evidence that he did not just show up at the meetings to be seen, rather, he carefully listened to the administrative presentations and BOE questions, especially on the Learning For All Plan, and has processed and understands the complexity of issues that the board is facing. Next we want to highlight some of the individual characteristics and accomplishments that make these four candidates the most qualified to serve our community for the next four years. We are not simply going to list all of the things that they have done or identified during the debates or interviews. Instead, we will point out the things they said or did that mattered to us most. As a parent in D181, Ms. Burns has already shown her commitment to our district through all of the multiple PTO, volunteer, and district-wide committees she has served on. During the debates, Ms. Burns emphasized the need for the BOE to have a strategic plan in place that will guide their decisions over the next four years. Her marketing, strategy and management background and experiences will enable her to participate and even take a leading role in the development of a meaningful strategic plan -- a road map showing where the district is now and where the BOE wants to take it -- not just an ever changing "process." Her financial background (MBA) will allow her to quickly grasp all of the financial issues the board will face and any tough financial decisions it might have to make. Ms. Burns' temperament is calm, cool and collected. We believe her when she says she wants to work collaboratively with her fellow board members and the administration, build consensus for decisions while expecting accountability from the superintendent. We have listened to pod casts where Ms. Burns has made public comment, and she has been extremely respectful while presenting critical comments and concerns. Ms. Burns has recognized the need for each learner's needs to be met, but believes the current Learning For All Plan is lacking in supporting data and it is time for the administration to analyze and present student performance data to establish whether or not the plan is working. We couldn't agree with her more. Mr. Czerwiec's passion for education, fiscal responsibility, transparency in government and accountability shine through all of the public comments he has made and answers he has given in interviews and during the debates. He is not afraid to tell it the way he sees it, and this is a much needed characteristic to have in a board member. As with the other three candidates, he has concerns about the Learning for All Plan and the lack of data to support what is currently happening in the classrooms; however, we have gleaned his position to be that he does not oppose more inclusive classrooms as long as they do not diminish the educational opportunities for any of our students. Mr. Czerwiec has been a teacher and understands the role of teachers as the front line soldiers educating our children. We believe that if elected, his educational background, honesty and open mindedness will allow him to work collaboratively with his fellow board members and administrators to insist that performance data be analyzed and presented to the BOE before any more phases of the Learning for All Plan are rolled out. Mr. Czerwiec has presented his ideas and concerns on capital improvements relating to our schools to the BOE for over 5 years. Those who have followed the history of improvements at Hinsdale Middle School know that years ago, when the BOE was selecting a vendor to install central air conditioning at HMS, he correctly forecasted some of the structural issues the building could face if the job wasn't done correctly. Many of his concerns came to fruition last winter during "moldgate." His astuteness and desire to thoroughly vet all capital improvement options before taking anything to referendum is exactly the kind of fiscally conservative approach we want our board members to take. We, the bloggers, have been attending or listening to BOE meetings for over a decade. We have become quite familiar with the parents who regularly attend them, make public comments, and keep parents who don't attend informed. Mr. Giltner "joined the party," so to speak, about six months ago. We have been extremely impressed with how quickly he has grasped the multitude of issues that have enveloped the Learning for All Plan roll out and his common sense approach to evaluating it. The answers Mr. Giltner gave during the debates convinced us that not only has he recognized, as the other candidates we are endorsing, the need for student performance data to be analyzed and the program's success be measured with concrete data, he has also recognized that we cannot lose sight of our student's next educational step -- high school. He has identified legitimate, real world realities, that our children will face the minute they get to high school, and are no longer taught with the  integrated services model that is currently being rolled out in D181. Instead, he has pointed out that in high school, there are multiple tiers of classes, from regular grade level classes, honors and AP classes, just as there are multiple tiers for sports, and other activities our children are involved in. We look forward to a board member who will talk candidly about the "real world" and hopefully make this part of the discussion as the new BOE decides whether or not to continue the Learning For All Plan roll out as has recently been proposed. Mr. Giltner's financial background will also serve our taxpayers well. He should have no learning curve in understand the district's budget, budgeting process or tax levy process, and we hope that he steps onto the finance committee as one of the two board committee members. Ms. Gray has been an extremely active parent, PTO and district level volunteer during the eight years she has lived in D181. Time and again, she has shown her commitment toward improving the educational experiences for all of our children. We have seen and heard her speak during public comment at Board Meetings for over two years and she has always presented her comments in a calm, professional manner, backing them up with facts and asking -- not telling-- the BOE and Administration to please make data-driven and fiscally responsible decisions. She has asked for the district to consider implementing full-day kindergarten for our students, something that Dr. White has also now identified as an issue that should be explored. Ms. Gray successfully started a petition that led to smaller class sizes at Monroe School. As a concerned parent, she advocated for equitable distribution of differentiation specialists at our schools. In the past, each school had one gifted teacher assigned to it regardless of size, but when their role was converted to that of differentiation specialists, Ms. Gray  advocated for a different approach to assigning the differentiation specialists at each school based upon actual student population and the specific student needs at each school. Ms. Gray has had first hand knowledge of the impact on students of the Learning for All Plan. One of her children was in the 3rd grade class that was forced to participate in the math compacting and acceleration for all component of the Learning For All Plan. Ms. Gray not only presented her concerns during public comment about the negative impact the compacting was having on students who needed grade level math instruction, but she also worked behind the scenes, meeting collaboratively with the administration to bring back grade level instruction. Now, math compacting for all has been eliminated from the Learning For All Plan at the elementary level. Ms. Gray, however, has publicly stated that student performance data must be collected, analyzed and reported to the BOE in order for them to be able to assess the success of all aspects of the Learning For All Plan over the last three years. We agree. Ms. Gray's legal training and experiences give her the necessary analytical skills to objectively evaluate issues and decisions the board will be asked to make in the next four years. Her past legal work on tax matters establishes that she has a working understanding of the tax laws and will be able to jump right into the budgeting and tax levy process without first having to educate herself on the how to's. The district is facing possible cuts in state funding and with a possible capital improvement referendum looming, Ms. Gray's answers to financial questions have established that she will not be a tax and spend board member. Rather she will show fiscal restraint and make the interests of all taxpayers one of her priorities, while balancing the need to improve the educational programs for our students. Burns, Czerwiec, Giltner and Gray are the four candidates who will collectively bring to the board table over 30 years of active volunteer involvement in D181, advocacy for ALL of our children's educational needs and a stated intent to remain fiscally conservative and responsible to all taxpayers. If elected, we have no doubt that they will be responsible board members, who come prepared to all meetings, well versed in the agenda items and ready to have meaningful, open discussions that the public can hear. All four candidates have publicly acknowledged that what has been sorely lacking in D181 is a proper forum for parents to present their concerns on educational and district matters that affect and impact all students and taxpayers. Some have stated that the community engagement sessions offered in the past did not provide a real opportunity for community members to engage in a back and forth exchange of ideas. It is no secret that public comments are one way exchanges and questions community members ask during public comment are almost never addressed by an administrator or board member. Nor is it a secret that only two board members, Heneghan and Garg, take the time to answer emails community members send to the board. Nor is it a secret that very few parents are selected to work on district wide committees. Finally, the "surveys" parents have been asked to complete on a variety of issues, have been very limited, and in our opinion skewed with questions that will lead to the answers the administration is seeking. What is needed is a regular open forum, such as a town hall meeting, for all interested community members, staff members and taxpayer to participate in an open exchange of ideas. More importantly, a forum where parents can feel empowered because others are in attendance and where there is no fear of repercussion for speaking openly. These four candidates have either publicly supported holding town hall meetings, or based upon the answers they have given in interviews and during the debates, we believe would agree to such a forum if elected. We fully support such an idea, and hey, wouldn't it be nice if open, town hall meetings, would obviate the need for this blog? So, on April 7th, don't forget to vote. In fact, you can still cast an early vote before leaving for spring break. On April 7th, vote for the candidates that you believe have the best understanding of the issues, will not take one to two years to get up to speed (as one of the candidates has suggested is the usual time frame), will serve all of our community and students in a fiscally responsible manner with the end goal being (as it should be) providing excellence in educational programs for ALL OF OUR CHILDREN. On April 7th we will cast our votes for Burns, Czerwiec, Giltner and Gray, and we hope you do too! We will be posting our endorsements for the D181 BOE election on Thursday, March 26. Unlike the Hinsdalean's endorsements that were picked in large part by an editor who doesn't even reside in D181, our picks will name the candidates that we will personally be voting for. Our votes will count and we will vote for the candidates that we believe will best serve all D181 students and taxpayers. Until Thursday, we will be highlighting comments written by our readers discussing what voters should consider before voting. On the D181 election, I cannot support Amy McCurry's candidacy. While many in the community like Ms. McCurry, this is not a popularity contest and it is important to vote for the candidates that are ready to serve and have a working understanding of the district's finances or a true financial background. Ms. McCurry does not.In the information she gave the Hinsdalean on what she thought of the last tax levy, rather than answer that question in a substantive way, she said that she "looks forward to learning more about the tax levy process and all the factors that go into calculating a levy request." It is disappointing that she hasn't schooled herself up on how a BOE sets a tax levy, the most important task our elected officials are responsible for. With all of the upcoming financial issues that the district is facing, I and other taxpayers shouldn't have to wait for a newly elected official to learn the tax levy process before they can start making decisions. In the next year the BOE will not only negotiate a new teacher's contract, it will have to analyze the financials on an HMS referendum (whether it be for a new, renovated or expanded school). It will have to face the possibility of losing millions if Senate Bill 1 is passed placing the financial burden of funding teacher pensions on local districts. It will have to decide whether to potentially grow the budget or make cuts to existing line items to free up to $2 million needed to pay for "coaches" for each school to teach our teachers how to teach the integrated, social justice model Dr. Schneider is ramming through in the Learning for All Plan. Despite Ms. Lannon's recent glib statement in an editorial in the Hinsdalean, running a $50,000+ school budget is not the same as using a "common sense approach" in "balancing a family budget." That statement was "sophomoric" to borrow a phrase used by another commentor on this blog. No doubt, after interviewing Ms. McCurry, this statement was inserted in the editorial that ran the week before the Hinsdalean's endorsements, setting up the safety net to protect Ms. McCurry's financial weaknesses. Agree with previous comments. Also Mr. Turek during his first term has diminished public comments, fellow board members and expressed that the people he knows are all happy, so things are working fine. For someone who lives on one side of town, to use that input and apply it across the board is pretty unfair. He has not supported town hall meetings to avoid answering tough questions. He is not able to understand the test data and always seems to go back to the admin are the experts. Stopped listening to the podcasts in 2013 since there was obviously some kind of an ol boy network in play. Schuster could do no wrong and yes schuster, russell, and schneider did walk on water. Mr. Turek would constantly state what an exceptional state our district was in, how great these people were and thanked them profusely for their hard work every time they presented the same re-invented slides. Now the prior administrators are all chopped liver and are constantly the scapegoats for all of the district problems. All we hear is Schneider's lack of accountability for what his colleagues did. So what did he do for his first two years in this district? Igoe was doing all the special ed work. Benaitis is the biggest waste of tax money but the board obviously doesn't feel they should put a stop to the waste. Better to show solidarity and hold up the house of cards. I would take a little of the D86 board and put it into the D181 board where there is no oversight, just a lot of pushing the envelope around the table. I have to agree with 10:03. I also agree with 4:54. But how do we know that having just one math coach per school will make any difference? There are still 22-25 kids per class with one teacher. How can one teacher meet the needs of all of these students from below grade level to accelerated and gifted? How many classrooms are in a school? How is one math coach going to make a difference? Schneider's and Benaitis's saying All Hands On Deck, well that's what these classrooms are going to need my friends. More hands! That $2 million dollars for math coaches is just a drop in the bucket compared to what it would really cost. Teachers will need help and to put in a program without the resources to help them is not fair to the teachers or to the students. And frankly the administration doesn't know what they'll need. None of them have any expertise in doing what they're doing. It comes down to the community deciding do they want their taxes to pay for a learning plan that has already produced failing results for the current 5th graders or not? I'm all for supporting teachers and our children but not on a plan that has already produced failing results. I think it's somewhat fair to say (unless you have been fully engaged) that if you don't have a current 5th grader (the parent of a student in the experimental class) then you really don't know what's going on. It's very important that parents vote in this election but understand what you're voting for. The integrated system will increase your taxes. Schneider and Benaitis have stated that they need all hands on deck. Teachers will need support. But let's be clear, this learning plan has not had good results with current 5th graders. You have to know what this plan means for your children. Know that it is one classroom and one teacher for students in grades K-5. Know that tiers will be removed out of middle school with grade compacting in math, and only ELA and ACE Social Studies for all students. And if you don't know what that means, you need to call the middle school. Reach out to a 5th grade parent and ask them what compacting means. And if you have students that are already double accelerated in math, you need to understand what an integrated classroom means in that situation. Look at the Learning For All document. Go look at the goals. And parents need to understand that this administration doesn't look at data. They have not made one data driven decision in 3 years. They just do what they want. So don't be fooled by little * saying we'll look at data and talk to the teachers. They don’t care what the teachers say. Schneider may parade his little entourage of teachers in front of the BOE but those teachers are not representative of the entire population. And Schneider knows it!! Make sure you understand who you are voting for on April 7th. I’m voting for Burns Giltner Gray and Czerwiec. Did Ms. Lannom really make that statement comparing the school district budget to a family budget? I don't read The Hinsdalean so I didn't see it. If so, that says volumes. I'm sure she thought that Mr. Giltner and Ms. Burns have strong financial backgrounds and so perhaps Ms. McCurry could lean on them but, in our community, we have a plethora of experienced candidates who are ready to serve on election day. D181 is not starter district for teachers, administrators nor BOE members. The elementary classes that are currently inclusive are only consistently meeting the needs of the middle group and even those less than the former ability grouped system. The new math materials were selected, in large part, for how well they could be used in an inclusive classroom. The Madison parents spoke out against Investigations but what many don't realize is that part of what they didn't like was inclusive classrooms and less time with a teacher for their students. What they don't realize is that that is what is coming for them next year with Math In Focus. Better materials, maybe, but same delivery. I don't believe the DOL when they say that they will let teachers ability group with tiers using above grade level materials. That goes against everything Learning For All has been about since day 1. And, if that was the case, why didn't they use that delivery method with the pilot classes? Pilot classes were also limited to primarily use of grade level materials with the ability to "pull from" above or below. Talk about haphazard and inconsistent. Every school/class/grade will be doing something different. Who will be keeping track of it all? How will we standardize and assess student growth and learning. And, the most important question of all, why are we doing it and what data supports it? The next question being, how can our district possibly support such a system financially and what else will we have to cut to make it happen? An improved Science curriculum, full day kindergarten, an improved foreign language program? And, again, WHY are we doing it? Inflexibility and poor identification issues were easily - and very inexpensively resolved. What a huge waste of resources this has been. Oh well, it's just money, the people in D181 have plenty to spare I guess... Vote Gray, Giltner and Burns. For those people tempted to vote for only three candidates. That is basically a vote for Mr. Turek. If you do not want him back, vote Gray, Gilter, Burns, and Czerwiec! Comment of the Day: D86 BOE Majority's "Circus"
This afternoon, we received a comment asking us to post campaign links for the D86 Skoda slate. We declined. To clarify, while this Blog focuses on D181, what happens in D86 will impact most of our students (some will go to private high schools). For the reasons stated in our 3:39 p.m. Comment to the 3/19 Post, we will not post comments that attach links to Skoda's campaign materials. In the interest of respecting freedom of political speech, however, we will post resident's "comments" expressing their opinions on the D86 candidates, as long as they do not contain profanity, lies or unfounded allegations. And so we begin with the the following comment that attached a link to highlights of D86 BOE meetings and the Circus-like antics of the Skoda/Manley/Cassini/Corcoran "Majority." This Comment of the Day speaks for itself and should, in our opinion, make anyone thinking of voting for the Skoda Slate on April 7th run for the hills OR make the right choice and vote for Planson, Hirsman and Carpenter! Thursday's themes were all about bullying and endorsements. What is bullying and have the bloggers, D181 administrators, D181 BOE members, spouses of D181 candidates or others been actively engaged in bullying? Who did the Hinsdalean endorse and does anyone really care? Two comments stood out and we are posting them below as our comments of the day. As always, SOUND OFF! 4:32, just because you don't agree with me, I have a hard time understanding how a nice person like you feels so comfortable throwing out insults like "Use your comprehension skills!" That is just rude. And vitriolic. But let's make this clear - NO ONE thinks BULLY is a bad word. It is NOT a bad word. That is why schools and teachers use it each and every time they talk about bullies. That is why there are BOOKS about bullying in our elementary school libraries, and that is why Mr. McCurry used the word himself multiple times in previous paragraphs. Teachers never refer to it as the B WORD! For goodness sake is right! Yes bullies are BAD, but no one, not a 5 year old or a 50 year old says B word instead of the word BULLY! And if he really thinks that, then he is more out of touch with reality than I thought. But just to humour you, let's just say that your incorrect understanding of the B word was correct. Wouldn't it also be somewhat BULLYISH to even call another child a BULLY? Or even a B? It isn't nice to call or label anyone in a negative way, especially a chilld. EVER. The point is: Mr. McCurry is a hypocrite. People shouldn't go around criticizing others on a blog OR a newspaper OR in person and think that bullying is only possible when it is on the internet! It is still bullying if it happens in a phone call, in person, with or without your name attached. It is still bullying if it happens at a board of education meeting, on the playground or in a fraternity. Look at what happened in D86 the other day when Manley berated a high schooler for starting a petition because she was offended by it! The petition was not respectful to Ms. Manley, but from what I understand, Ms. Manley has a long history of not showing respect. That's why everyone wants her to resign! Manley doesn't give respect to anyone else, yet somehow expect it from everyone! Skoda's group feels that they are the only ones who are EVER right. They refuse to see the point of views of others. Ms. Manley was so frightened of a child exercising her freedom of speech, that she started to berate her. Just like Mr. McCurry attacks the blog. Will Ms. Manley ever agree with the high schooler? Probably not. But that girl still has every right to pass out flyers or start a petition. And the blog has every right to exist. Like the Skoda crew, Amy McCurry believes that she and her ideas are above reproach, evidence and policies. That only a few deserve power over what is occuirng in our children's schools. They feel it's acceptable to berate, dismiss, or ignore others, but God Forbid someone else criticize THEM. That's just not ok. Bullying doesn't just happen at D86 meetings. It has been happening over and over at D181 meetings for for years now. It doesn't JUST happen on anonymous internet sites. It happens to teachers from Adminisitrators, principals to teachers, parents to teachers, and bosses to employees. It comes about when one person refuses to accept the FACT that in America, having a differing opinion is legal. Especially when it concerns your own child's public education. We don't have to agree with the people who run our public schools. They are not private! Parents need to speak up. People who do speak up are taking the time to GO to meetings and participate. They are LEARNING about the issues and concerns that are facing our kids. Just like the the McCurrys, these parents also deserve respect. Criticism part of life, especially if you choose to put yourself in the public eye. Have you ever read Angie's List? Amazon.com? A product review on Sears or Nordstorms? For your doctor? If you haven't, I am not sure where you have been. When my childrens educations are being led in uncharted, unsupported territory with my own tax dollars, you better bet I will speak up. And if the way I want to do it is through a public blog that gives access to EVERYONE, what is wrong with that? That is better than the secretive D181 administration does! Sure, I could post on The Wives of Hinsdale website or go laugh at the Commity House's spoof on our town, but I just think my time would be better spent posting on a blog that concerns itself with my child's education. What's wrong with that? If you don't like it, don't do it. And if I want to criticize an article that a candidate's husband writes in the paper, I can. That's my right. Just as it is yours to criticize what I write on this blog. But get over yourself. If you don't like what is on this blog, go start your own blog. But let's face it, you would be too narrow minded to ever post anything that you didn't agree with. Just like a bully. I, for one, really don’t care who the Hinsdalean endorsed today. Like a reader said before, that paper goes from my driveway to the garbage, never coming out of the little plastic bag it arrives in. And the only reason I know who was endorsed was because of this blog. I have not even read the article. I learned long ago that Pam Lannom paints a very different picture than what actually occurs at board meetings so it really should come as no surprise to anyone that the endorsements were presented as they were. I choose to look at the Hinsdalean not endorsing Gray as a positive. So bare with me......The Hinsdalean is about portraying a perfect town. And don’t get me wrong it is truly a beautiful place. It’s one of the reasons we moved here. On the surface it’s everything a family could ask for....gorgeous homes, tree lined streets, a quaint little down town, so many parks to choose from, but the real draw....the schools. And the Hinsdalean does its part to perpetuate this image of perfectionism. But as many people have found out once you start peeling back the layers, things don’t look so pretty in Mayberry. And it’s not just with the state of our district, it’s a lot of things, but I’ll stick to the education piece. I’ve attended board meetings and have left them blown away. Put it this way, I wouldn’t have a job if I pulled half the stuff some of these administrators have pulled, from incompetence to insubordination. And I would be dismissed from sitting on the board of directors of an organization in the real world if I were as disengaged as some of those members are. And all of this all at the expense of children. But then I would read these board summaries written by Pam Lannom and would think to myself, were we at the same meeting? It didn’t take long for me to realize, it’s all about the image with her. Well Ms. Gray is not about the image. She is about the substance and one of the most qualified running for the board. Ms. Gray knows what the issues are. And guess what, so does Pam Lannom. But she’s about selling the image and not the truth. I’m smart enough to vote for candidates who are qualified to actually DO the job and will not just pretend. The pretenders are all about perpetuating the idealistic view of Hinsdale. And this town can’t be propped forever on an image. Maybe the district used to be great. But from my vantage point, it’s not looking so rosy anymore. We have serious issues and need serious people to represent the community. If you’re new to this blog or if you have questions about what’s going on in this district, start reading right here. Learn what the issues truly are. I can promise you that you will not find them in the Hinsdalean. I will be voting for Gray, Burns, Giltner, and Czerwiec. Jill Quinones' Guest Column in Today's Clarendon Courier: A Commentary on the "Positives" of the "Blog"
We have been alerted that the Clarendon Courier ran two "columns" today dealing with our Blog. First, thank you again to the Courier for the free publicity. The first column was written by Mike McCurry, one of the Courier's regular columnists, a "prominent advertiser" in the Courier (see Courier Editor Ellis' comment to 3/13/15 Post), a Clarendon Hill's realtor and husband of D181 Candidate Amy McCurry. We are not going to publish his column because we are turned off by Mr. McCurry using his column in any way to reference his wife's candidacy, after Mr. Ellis specifically stated during the Courier debate last week that his paper would not be issuing any endorsements. If other candidates' supporters have to pay the Courier to run advertisements (case in point, the Hinsdale Caucus ad), then why does Mr. McCurry get to do an end run around this? Just the latest example, in our opinion, of the conflicts of interest that have cast a shadow on the D181 election season. 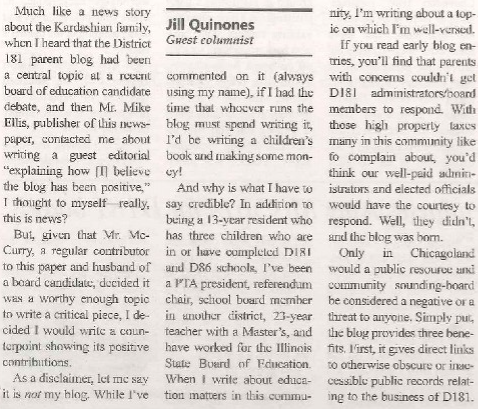 We are, however, posting a copy of Clarendon Hill's resident Jill Quinones' column, that Mr. Ellis apparently invited her to write. As Ms. Quinones points out, she is not the "blogger" although she has posted on her name to the blog. Thanks to Ms. Quinones for her insightful and appropriate column. Part 1 - When Mr. Ellis asked me to write the column he didn't tell me the focus of Mr. McCurry's column would be on the anonymity issue or I would have addressed it more. while I am not a fan of anonymous comments that bully, I think Mr. McCurry is a bit detached from what actually occurs in D181 when he says that the only reason to justify posting anonymously would be to avoid terrorism, tyrannical regimes and/or severe punishment, but that those things don't exists in our community. One only needs to look at the D86 Facebook Ax Through Window fares that had teachers temporarily threatened with legal action for merely liking a Facebook post until saner heads prevailed. One can tell from some of the anonymous comments that these are D181 teachers posting. If you think they are not concerned about retaliation, you are wrong. Parents, too, fear retaliation from District Administrators and Board Members - against their children and themselves. And, yes, there have been instances where unfortunately this has happened when parents have spoken up in their school or at BOE meetings. I am not one of those parents because woe be the teacher or administrator who unfairly messes with me or my student, but if you know me you know I am a little more outspoken than most - another reason for anonymity. Part 3 - Final reason for anonymity - feet of critical judgement by your fellow community members. Again, I could care less if others disagree with my opinion - every one is entitled to their own. And I try not to use my opinion to harm or bully anyone. But honestly, this is a very judgmental community. 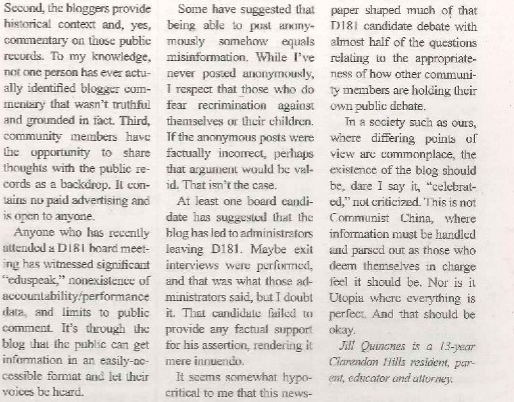 I have lived in many different communities, and as lovely as my friends, neighbors, and acquaintances are here in the D181 school district, strong opinions and judgements are not only belonging to anonymous bloggers. Some people are honestly afraid of being ostracized (themselves and/or their kids) for voicing a different opinion). Should their fear require them to stay silent? Part 4 - I have tried to re-read some of the comments that were posted about Mrs.McCurry on the Blog. I certainly don't have the time or desire to review all of them. I suppose the fact that the Bloggers chose to articulate that they didn't think Mrs. McCurry was an appropriate candidate and give reasons, reasons onto which others added their thoughts, could be perceived as bullying, but I wish Mr. McCurry could have articulated some specific comments that he thought were bullying. When there are more candidates running for an office is it bullying to point out the weaknesses of an opponent as well as pointing out the strengths of the candidates you support? In my opinion it would depend on (i) whether you were attacking the person's character (bullying) or just his actions and stands on issues (not bullying), (ii) dragging personal issues into the comments (bullying) or stating non-emotional facts (not bullying). It is sad how politics very often gets down to candidates ripping each other to shreds, but I guess I missed the attacks on Mrs. McCurry's character and intelligence that Mr. McCurry notes. Questioning a candidate's level of experience, which he also believes is bullying, I think is fair. The Hinsdalean has published its endorsements of the D181 candidates, and our readers aren't happy. Neither are we, but we aren't going to give that newspaper any credibility by actually publishing who they picked or their naive and ignorant reasons why. Instead, we are going to post the comments we have received so far and provide this free standing post for anyone else who wants to SOUND OFF! We will be publishing our endorsements in the next week, so stay tuned. I am extremely disappointed in the Hinsdalean. Leslie Gray, above all the other candidates, deserved its endorsement. She is the most qualified of the six candidates which was plainly obvious from both the Hinsdalean and Clarendon Courier's debates. I believe they got it right by endorsing Jennifer Burns and Richard Giltner. However, the Hinsdalean certainly showed that Mike McCurry's advertising dollars speak louder than strong qualifications by endorsing Amy McCurry who decided to run over a champagne dinner and couldn't answer a question at the debates without reading from a script. I can't believe Gray wasn't endorsed and McCurry was. Between the conflict of interest and lack of knowledge and depth that was apparent in both debates and in the impromptu questions asked by the Hinsdalean for publicaton, it is obvious that Ms McCurry is nowhere near qualified to hold this position. "I look forward to learning about the levy process" is just one glaring example." My guess is that The Hinsdalean didn't like the fact that Ms Gray went strongly on the record in opposition to some aspects of the Learning For All plan. In doing so, it missed an opportunity to endorse needed diversity on the Board about this plan. By endorsing Turek and McCurry, both huge supporters of the plan, we are left with only Giltner and Burns to hopefully bring an objective perspective about this plan if they win. Hopefully the community will see this error and necessity more clearly than The Hinsdalean did. Learning For All has been a colossal failure by almost all accounts. More of the same rubber stamping of this major initiative is not what we need at the BOE level. Objectivity and a strong command of facts and details is. Well if there was any doubt of bias, it is all clear now. Of course the Hinsdalean can give their opinion (they own it) which they really shouldn't be. I agree with Mr. Ellis of the CH courier, it's not their job. Having attended the hinsdalean debate I can say hands down, Mr. Czerwiec was the most articulate and knowledgeable candidate. He won the debate as far as I would tell and no I do not know Mr. Czerwiec. What was also clear was that Ms. Mccurry had no knowledge of the tax levy and district budgeting process. SO for her to be endorsed over someone who clearly understands the issues is mind boggling. Is it better to have someone who understands school finances, the levy and who by the way was a classroom teacher or someone who supports a plan that has worked well for her kids and was a special ed teacher (deals with a smaller number of students)? Aren't we all lifelong learners? Why is it that it is implied that educators are the only lifelong learners? We are all constantly having to learn new things at the workplace. I would like them to see the rigorous board exams and license exams various professionals have to take to remain certified. I also felt that Mr. Turek lacked knowledge of the tax levy and has shown no evidence of holding anyone accountable including himself. I'm just curious why the Hinsdale had a picture (and name) of Planson instead of Gray. Plans is running for the 86 board, not 181. Was this intentional, or just a mistake, like that one D86 news article on Facebook that accidentally had the axe through a windshield? 1. Why just add Clarendon Hills to their free distribution list? 2. Could it be because they are endorsing two candidates who live in Clarendon Hills? 3. How many homes are in Clarendon Hills -- a couple thousand? 4. Why would a Hinsdale based paper, deliver for FREE, a paper to Clarendon HIlls? It obviously isn't FREE for the paper to run hard copies for all of these homes? 5. Why would the Hinsdalean take money out of their profit margin to run hard copies for all of the Clarendon Hills residents? 6. Could it possibly be that someone is funding these extra copies, and if so, who is? 7. If the Hinsdalean is paying for these extra copies, why are they not running copies for all of D181's residents? Could it be that they have been pressured in some way by some of their advertisers to deliver copies this week to Clarendon HIlls? If so, who are these advertisers (or advertiser)? Many questions to ponder. Of course, no answers will be given. As for the Hinsdalean's endorsement of Turek, I am completely disgusted. Consistency? Good leadership in the last two years? Praising him for the teacher's contract? So disappointing that the Hinsdalean has overlooked the fact that Turek didn't lead the negotiations. Vorobiev and Clarin did. He just voted. So disappointing that the Hinsdalean overlooked the list by the bloggers of 22 reasons, all based in fact and actions/statements made by Turek, that show clearly that he has not been an effective board member to our children and taxpayers, but just to the administration. Pam Lannom has no children in D181. For her to suggest that it is important for the Learning for All "process" to continue to roll out is irresponsible journalism! It was not a "process" when I voted for it. It was a plan, and I only voted yes because it was going to pass since the majority of the board wanted to rubber stamp what the administration wanted, but in order to hold the administration accountable I and Brendan Heneghan voted yes, something Turek personally promised me he would make sure would happen. Three years later, there has been no accountability. No data to prove that the plan has worked. And yet Turek "loves the plan" as he has repeatedly stated during the debates and board meetings. It is truly disturbing that the Hinsdalean has reached the conclusion that the L4A plan should continue, a conclusion that will only hurt our children, should Turek get reelected. On April 7th, please vote for 4 candidates who have recognized the deficiencies that exist in the district's administration and the L4A program and will not just roll over and pretend that all is rosy. These 4 candidates will not just rubber stamp the plan/process continued roll-out, but will demand data and demand accountability. That is NOT MICROMANAGEMENT, no matter how much the Hinsdalean likes to use that word. 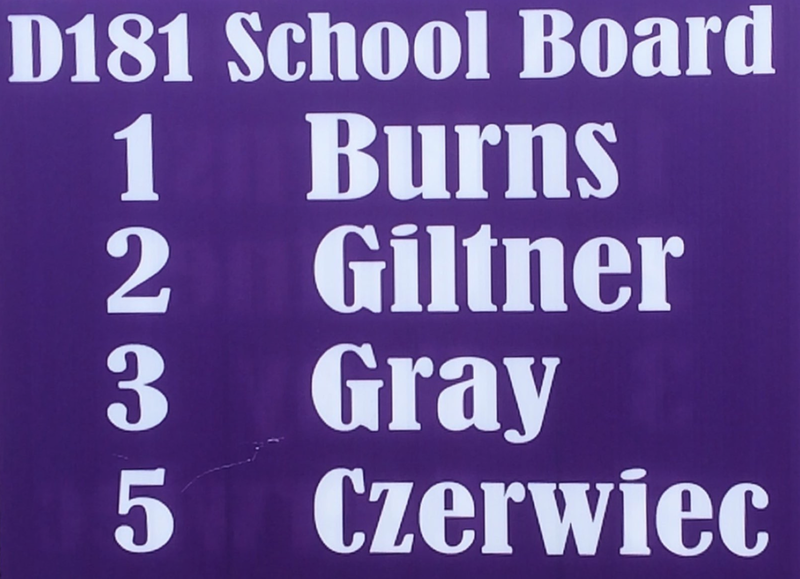 On April 7th, vote for Burns, Czerwiec, Giltner and Gray! Oh yeah, and Turek didn't care at all that I was physically assaulted by a fellow board member. That is the icing on the cake. He not only disrespected me as a fellow board member, but as a woman, and his refusal to take a public stand on any type of physical abuse should be reason enough not to vote for him. He laughed at the Clarendon Courier debate when he referenced the blogger's list of reasons not to vote for him, but none of the reasons, especially that one are funny. It is clear as day that the Hinsdalean sold out to the highest bidder. They will whine and cry that "it ain't so" but do they really think the community is that stupid to not see this political gaming for what it really is. Clear as day that McCurry's husband is a prominent advertiser. Doesn't each full page ad he runs cost just under $1000? If he runs one full paid ad each week, that is $52,000 per year. No way can the Hinsdalean afford to lose his advertising or that of other realtors who might support his wife running for the BOE. The Hinsdalean will claim, "no way, no way, journalistic integrity rules the day," but I'm not buying it and neither are other intelligent D181 community members. If Ms. McCurry had actually given substantive, knowledgeable, fiscally responsible answers to the questions she was asked during the Hinsdalean vetting process and during the debates, then maybe, just maybe, their endorsement would make sense. But anyone closely reading all available material and who has watched both debates knows full well that she is the least prepared of all six candidates to serve our children well. Nice lady, maybe. But nice won't help our kids. I have respected Ms. Lannom since she was just a reporter in a different era of community newspapers. It is silly to attack the ethics of The Hinsdalean, the simple fact is they just don't have the resources to cover the schools in the depth necessary. As I have encountered anyone that truly expresses an interest in why the BOE needs change I have tried to state the case for fiscal restraint in addressing the issues facing our schools, accountability for the direction of the schools, renewed focus on the classrooms not bloated administrative staff (that apparently cannot handle the tasks they were hired to perform...) and, above all, equal access to high quality schools. Be sure to "LIKE" my Facebook pages too!